Benjamin Franklin was a superhero of his time. It might be true that he had a receding hairline instead of rippling abs but he made more of an impact on the United States and France than Batman has ever made on Gotham. Just think about his accomplishments! He worked with France to establish freedom from the Brits in the colonies. He wrote anti-slavery treatise so that all of America's people would eventually be free. And let's not forget all of the people he saved by inventing the lightning rod. We know that preventing natural disasters won't sell as many movie tickets as fighting villains in the street but we think Ben's multitude of skill makes him a superb hero, indeed. Transform into this revolutionary hero for your next costumed event with this Benjamin Franklin wig! You don't even need to fly a kite in a thunderstorm. Benny's instantly recognizable receding hairline is depicted in the wrinkled skin-like texture of the forehead. His gray hairs wave back into a do that hint at the wisdom of your years! 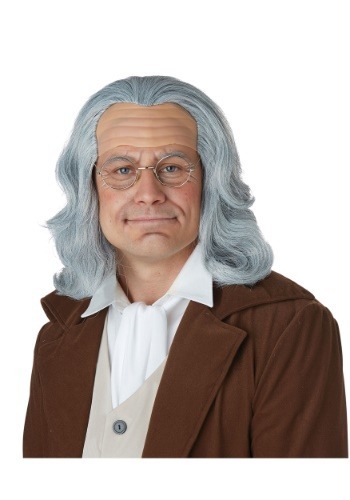 You might think that dressing as a founding father sounds a little dusty and uneventful. You'd be wrong. Ben Franklin was a man that was full of ideas, values, and the French found him to be quite the flirt. So, tighten your cravat and ready your wit, this wig is sure to add some electricity to your evening!